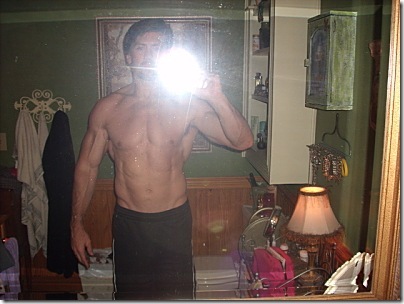 … no “diet down” preparation, no tan, no air brushing or Photoshop, no professional lighting, photography or staging. 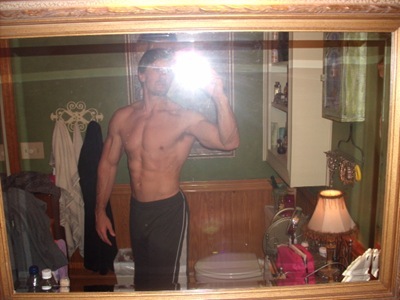 Just me, a cluttered bathroom, a mirror, a camera — and the results of my brand of a Paleo/EvFit lifestyle. I’m no different than most folks. I work eight to nine hours Monday through Friday, and sometimes a few hours on the weekends. Add to that a two hour commute each day. My work is mostly computer (writing related) and sedentary. Workout wise, I can usually squeeze in three sessions during the workweek, and maybe one over the weekend. During the week, I rarely have more than 40 minutes to get whatever I want in — that’s everything included — warm-up, cooldown, any post-workout stretching — everything. Needless to say, I’ve had to learn to be efficient in the weightroom and on the field. And efficient in the kitchen, as well. I might eat out once every two weeks or so. That means careful planning, efficient use of leftovers (and no aversion to eating leftovers), and toting my own meals into work on a daily basis. And when I do eat out, I special order and ask for substitutions (extra veggies in lieu of carbs, etc. ); I’ve long gotten past feeling like a prima donna when doing so. Hey, I’m looking after my health now, so as not to be a drain on society later. It’s a public service, of sorts. Plus, I’m a very conscientious tipper. Time as a waiter taught me to really appreciate those now waiting on me. I’m not here to sell you anything, or shill the latest and greatest in the wide world of diet and fitness hype-fest. Nor will I lie and say that it can be done free of substantial effort. I am here, though, to say that it can be done, if you so desire and if you’re willing to pay some dues in the form of some extended physical and mental willpower. I’m 40 so you are giving me something to aim for for my 44th! Impressive and inspiring to say the least. I am 38 and doing pretty good, but I want to be like you when I “grow up”. Definitely inspiring. I expected you looking good – but you look great and much more muscular than I expected. Thanks for being a great role model on the Paleo path! Were you into sports when you were young? 1) You seem to have as much mass as a bodybuilder — do you do bodybuilding-like movements? 2) Like Marc, what sports did you play as a youth? 3) How long does it take to achieve this level of fitness/strength? Also, any thoughts on CrossFit? Keith, Wow! Pictures speak a thousand words. I’m 49 and I’ll probably never reach what you’ve done, but I’ll certainly read every word of your blog with new admiration. Gave you a quick shout out on my blog. Thanks again for your great info and inspiration. Marc — I grew up in Texas and played the only sport recognized in the state at that time — (American) football 🙂 I also ran track (sprints 60,100 and 200 meters). I played college ball at what’s now known as Texas State (it was known as Southwest Texas State back in my day). I hate to give you a cop-out answer on results response time, but the truth is this: everyone responds at a different rate. Even if it were possible to somehow standardize the “input” effort, the results would still be all over the map. What I can say is this: you will be a better YOU in a very short period of time. Your body fat levels will be determined by diet (workout types/levels have negligible direct effects on this), and in those few who I have seen stick to a Paleo-like diet, the fat loss has been amazingly fast. The ability to put on muscle is much more individualized, in my experience. It’s analogous to sprinting ability. Some people are phenomenal sprinters naturally, some with all the best training in the world would not even make a small college cut. But all, with dedicated and proper training, would get faster than they are today. The key is to look to others for proper inspiration, but to compete and compare against your (old) self. I love the CrossFit philosophy, but I tweak that philosophy to fit my own needs and goals. More specifically, I like to concentrate on improving my power generation, however that power is expressed (sprints, a particular lift, etc.) in the 0-10 seconds time frame. CrossFit tends to include much more of what I would consider “endurance” work, which, for the community they’re geared to is perfectly reasonable. The key here is to know your goals and adjust accordingly. I will, every now and again, jump on one of their WODs and bust it out. It really is good stuff. Brad — If you look back through my posted workouts, you’ll find very little in the way of direct ab work. This is the one thing, though, that, if I had more time, I’d probably do a little more of. My abs, though, are more a product of sprints, weighted pullups and multi-joint, explosive weightlifting movements. The biggest contributor toward nice abs, though, is proper diet. You’ve got to get your body fat level down for that muscle to be readily visible. By the way, I’ve always been fairly lean due to my workout regimen and athletic past, but I never really had well-defined abs until I made the all-out shift to a Paleo-like diet. Excellent. BTW what is your BF %? I really have no clue what my BF% is, other than “low”. I’ve never been curious enough to go out of my way to have it checked. I did do a study at the ECU Sports Med. clinic back about 10 years ago, and as part of the study, my %BF was measured via the water submersion method. At that point, I measured 11%. I can tell you that I am at a much lower percentage now, as that was well before my Paleo conversion. If I had to guess, I’d say I’m in the 7-ish range. Very impressive. After I met Arthur DeVany, it changed my whole mindset on aging. One only gets better as they get older. It’s up to us, really. You’ve basically been athletic for most of your life, but how long have you been eating “paleo” ish? I’ve been full-on Paleo for 2 years, now. 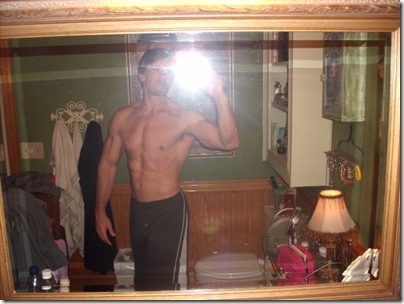 Prior to that, I ate what could be considered a normal, “athletic-leaning”, i.e., high protein, high carb, low fat diet. Wow, only two years… that’s incredible. I’ve had slow progress on a paleo-ish diet for about 9 months now. I feel tons better than I ever did. No longer get afternoon sleepiness, etc. I’ve lost roughly 17 pounds. I think I have another 20 to lose. In the meantime, I’ve cut out dairy to see if I can get faster progress. I admit I am pretty lazy and not very athletic. I’ve been adding some sprints, etc. a few times a week. I’ve been pretty amazed, though, how much you can lose simply with diet alone. And this diet is not at all limiting. When I’m hungry I eat, except on fast days. I used to be on the swim team, even set a record, but always had a sort of “puffy” appearance… a relatively thick layer of subQ fat. In just 9 months, I’m starting to see more defined abs than I used to have even as a teenager. I have a long way to go yet, but it’s pretty amazing what good food can do for body comp. I think if I modify my non-eating lifestyle a bit more, I could easily have a better body comp by next year than I’ve ever had, even as a teen. And I’m 34. FWIW, I think that consumption of (and the resultant effects of) raw dairy is a very individual thing. Not only do I not suffer any ill effects from its consumption, I seem to thrive on it (athletically speaking). What seems to effect my body comp and subQ fat the most, though, is a higher than normal fruit consumption and/or a prolonged period of even moderate alcohol consumption. And also FWIW, I think that if you were to up your fast twitch muscle fiber amount/percentages via intense weight room work, you’d notice a quicker subQ reduction. 2#s a month, though, w/o serious training — and especially given that you don’t have much to lose to begin with — is a testament to just how well this protocol works. I think my biggest problem is that I just need to get off my lazy arse a bit more. 🙂 Thanks for the weight training advice. 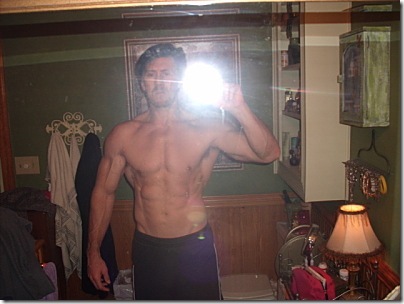 Even though I was never ripped when younger, I do buff up pretty quickly if I put my mind to it. I am 43 and agree that the sky is the limit. I used to train like some maniac over na hour 5 days a week when I was in my 20s and was always overtained but now 30 or 45 minutes is all that I need to get good results. Dude, you look phenomenal for any age!